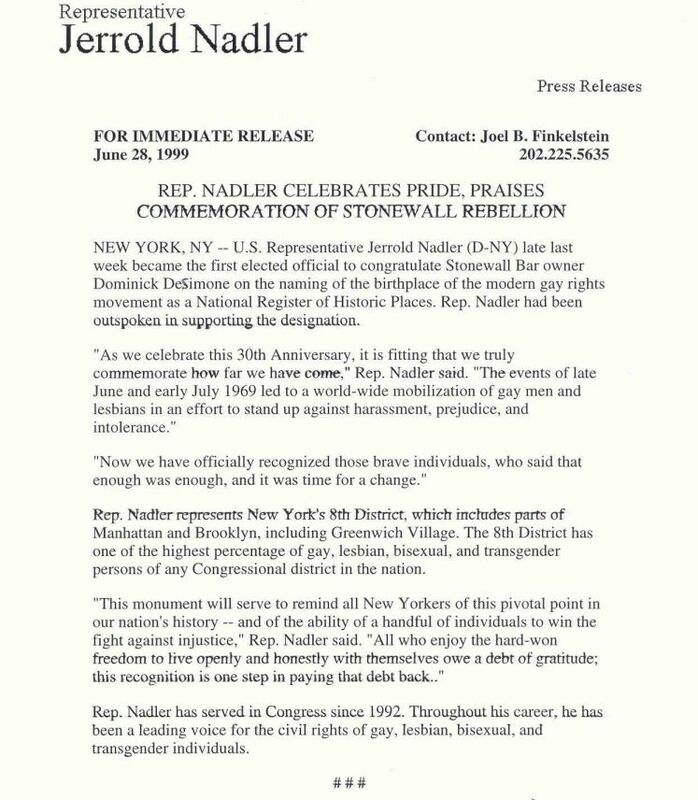 Gee, Congressman Natler, don'tcha think U should have congratulated, maybe, the real Gay people -- the alleged 'heroes' -- who orchestrated and performed the now applaudatory and historic Stonewall Rebellion of 1969 -- rather than the current (of so many) Stonewall Club heterosexual, I-talian, Republican (U know how U hate them) owners from Staten Island? "Gay Pride" and Demonic DeSimone? That's oximoronic! If it wasn't so pathetic... it would be laughable. U were not only "the first to congratulate" him (quoting your scribe) but, upon information and belief, U were the only! Meanwhile, U gave zero credit to the STONEWALL Rebellion Veterans' Association nor any Stonewall veterans nor the SVA's prominent leaders or any of its members. And that's called really rude! It appears, Congressman, that if this were 1969 when the Mafia still owned and ran the Gay clubs, instead of acknowledging the Stonewall People, U would have been praising the Stonewall good-fellas Zuckie, Mad Mario, Fat Tony and "Viscious Vivian" (nee Vinnie)! Shame on U! Congressman, your 'press release' speaks for itself (see below). The Stonewall veterans have rated it really rude, self-serving and shameful. It's been over a decade (June 1998) since your office or U donated one dollar to the S.V.A. nor attended any of our events including educational symposiums on the Stonewall Rebellion at locations such as the Gay Community Center and The New School nor any of the S.V.A. 's fascinating public forums. Yes, U've been invited like every other public official by specially mailed flyers, monthly faxes and e-mail blasts. There has been no attendance and no response. Again, it's really rude!